Census figures have given a boost to active travel in Belfast, showing a strong rise in the level of cycling in the city. In the ten years up to the 2011 Census, there has been a 60% rise in the number of Belfast residents using a bike as their main form of transport between their home and place of work. Broad modal share for commuter cycling in Belfast has also jumped up by just over 50%, with cyclists now accounting for 2.1% of travel to work share, up from 1.4% in 2001. The tables below show the method of travel to work for the employed working age population. I’ve compared the Northern Ireland headline figures with a split between Belfast Council area and the rest of NI excluding Belfast. Belfast has a much lower reliance on private motorised travel (Motorcycle, scooter, moped, car or van driver or passenger, can or van pool or taxi) than the rest of Northern Ireland, with greater usage of public transport (train, bus or minibus), walking, and now significantly over three times the rate of cycle commuting than the rest of Northern Ireland. The headline Northern Ireland figure shows a rise in bicycle commuters of 5% between 2001 and 2011, but delving deeper shows that Belfast is starting to leave the rest of Northern Ireland behind in modal shift terms. Belfast has seen a massive 60% increase in cycle commuters, while the rest of NI has seen a fall of 12%. While this poses some difficult questions of NI-wide policies, there is a clear challenge to allow Belfast to forge ahead with a wholly separate strategy for urban utility and commuter cycling. Private motorised travel to work, while on the rise in Northern Ireland as a whole, has stagnated in Belfast in the last decade. Yet interestingly, car or van pooling showed the biggest increase of any transport method in Belfast (80%) in part pointing to good work and outcomes from the Travelwise NI campaign. Public transport has also seen a dip in numbers of commuters, mostly due to a reduction in bus passengers. The number of Belfast residents travelling to work by train has risen by 72%, but interestingly more than twice as many people living in Belfast cycle to work than take the train. Similarly train commuters have risen by 63% across NI, obscured in the public transport category by a 15% drop in bus commuters, a much larger group. For more detailed information you can access the supporting data tables through the Census 2011: Key Statistics for Northern Ireland Statistics Bulletin on the NISRA website (PDF). One of the main points for future policy is the growing divergence between cycling levels in Belfast and the rest of Northern Ireland. Data gathered by Roads Service from cycle counters in Belfast has shown a quiet groundswell of cycling uptake over ten years from 2000 to 2010. Over this period, cycle usage at key locations in Belfast has risen by a staggering 152%, with some of the most popular areas (Stranmillis Embankment, Albertbridge Road) showing increases well above 200%. 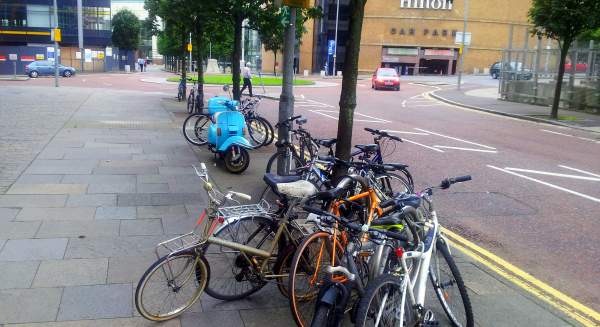 The early indications are pointing to real year on year progress in Belfast cycling levels. The census figures show, perhaps surprisingly, overall numbers of commuter cyclists have decreased in 19 of 26 district council areas in Northern Ireland since 2001. Of the top ten council areas by number of cycling workers, six have seen a decrease. The Belfast Metropolitan Area (Belfast, Castlereagh, Carrickfergus, Lisburn, Newtownabbey and North Down councils) has seen a 30% rise in cycling as the main form of transport, but this is mostly due to Belfast adding 853 new cycle commuters against just 47 in the other five council areas combined. Antrim, which had the fourth highest number of commuter cyclists in 2001, has seen a significant reduction of 42% in the last decade. Taxis in bus lanes – the twist? Recently DRD have signalled their intention to allow all taxis the use of bus lanes. A consultation received an overwhelmingly negative response, but DRD plan to press ahead. The majority of bus lanes in Northern Ireland are in Belfast. It is interesting to note that in the ten years to 2011, the number of people using taxis as a main mode of travel to work has decreased by 8% across Northern Ireland and by 24% in Belfast. This is compared to commuter cyclists rising by 5% across Northern Ireland and by 60% in Belfast. Comparing the absolute numbers, Belfast taxi commuters have dropped from 4,000 to 3,000, while commuter cyclists have increased from 1,400 to 2,300. This goes a little way to exposing the flawed reasoning as DRD move to prioritise taxi movements in bus lanes, to the expressed detriment of cyclists. The census figures released this week are broad headline travel to work statistics. As a previous blog post shows, we wait for a more detailed analysis of methods of travel to work by distance. For example in the South Belfast Parliamentary Constituency Area in 2001, cycling modal share for commuting journeys between 2-5km was already above 3%. The rise to 2.1% for cycling as a method of travel to work is just the beginning for Belfast. The question we must ask of government departments, politicians and Belfast City Council is: do you want to build upon this, and how far will you commit to seeing it happen? These rises are set against soft policies of advisory cycle lanes, advanced stop line cycle boxes, education and awareness campaigns and a nascent cycle to work tax relief scheme. We even have a city bike hire scheme in the pipeline. Supercharging these already impressive rises over the next ten years is possible with the right commitment to budget and priority. More hard measures such as quality cycle corridors instead of piecemeal unenforced/unenforceable cycle lanes, the Gasworks Bridge, junction priority and redesign can start to send a message to reluctant possible cyclists. Most importantly, better engagement and consultation with the daily cycle commuters can only help to identify the areas of greatest weakness, and boost the chances of working together to improve the city. DRD and Roads Service must recognise the growing importance of cycling as a form of urban transport in Belfast, and give much needed weight to our issues within the city’s network planning. There are some comparability issues with the 2001 Census – more information can be downloaded from the NISRA website (PDF). More detailed Travel to Work data will be released over the next 18 months. This will allow a more detailed look at cycling modal share increases over typical commuting journey ranges.